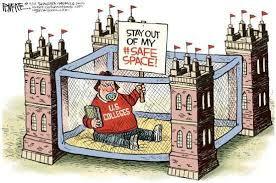 Freedom Of Speech is now protected even on dare I say it on … college campuses. The President just signed an Executive Order that would stop federal funding of colleges that don’t allow free exchange of ideas and thoughts. Even thoughts that might hurt others feelings and make them run to their safe spaces. Maybe we will actually learn to listen as well for G-D gave us two ears and only one mouth. The sad point is that it took an Executive Order to bring back Freedom of Speech on college campuses which those of the left used to protest until the speech came from the other side.